The Hilco fabrics collection is very innovative and contains only high quality fabrics. 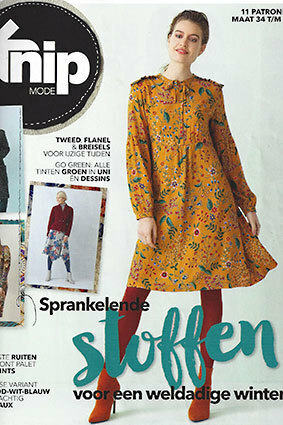 Hilco fabrics are regularly shown in editions of the sewing magazines Burda style, Ottobre design woman, Diana mode and Knipmode. Hilco fashion fabrics can easily be combined with our stretch linen, bio linen, plain viscose jersey fabrics and jeans fabrics. We hope to welcome you regularly because of our regularly changing fabrics collections and high quality designer fashion fabrics and last but not least high service and fast deliveries. Jersey Fashion ships to Australia, Canada, France, USA, Scandinavia and of course to all other European and non-European countries. New Hilco woven rayon satin fabric "Bianca Florale"
Woven rayon satin fabric, Hilco "Bianca Florale", inkjet, width 140cm, 100% rayon, 230gr/s.mtr. 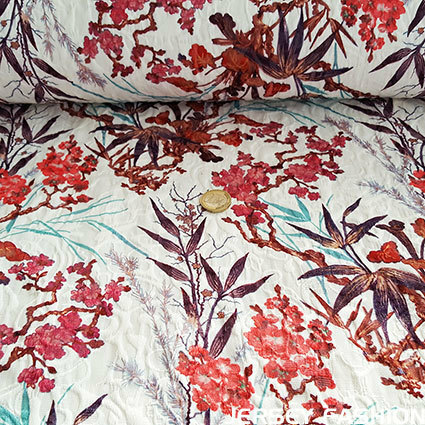 A stylish floral design, digitally printed on a woven rayon satin quality with a silky feel. The design is printed on a ecru background. This fine woven shiny rayon fabric is wonderfully soft, supple, comfortable and breathable. Perfect for blouses, dresses, lingerie, tunics, tops and more. The Ökotex certified rayon satin weave fabric is produced in Portugal. 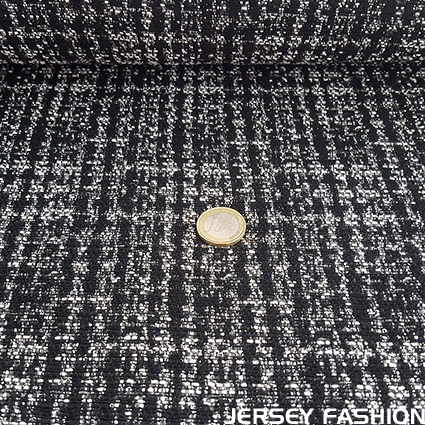 New Hilco woven rayon fabric "Isidora"
Woven rayon fabric, Hilco "Isidora", inkjet, width 140cm, 100% rayon, 125gr/s.mtr. An original floral design in linen look, in subtle color tones, is digitally printed on a woven rayon quality with a silky feel. This fine woven rayon fabric, also called artificial silk, is wonderfully soft, supple, comfortable and breathable. This light and semi-transparent fabric is perfect for blouses, dresses, lingerie, tunics, tops and more. The Ökotex certified rayon weave is produced in Germany. Hilco lace fabric "Biagio", old rose, width 145cm, 53% polyamide, 47% cotton, 150gr/s.mtr. 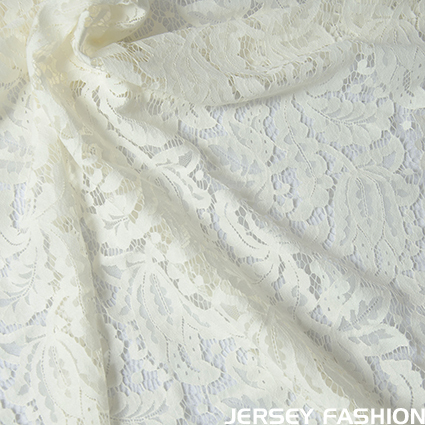 A supple lace fabric with a high percentage of cotton. A large floral pattern is woven in this elegant lace design. Lace fabrics have historically represented class and beauty. 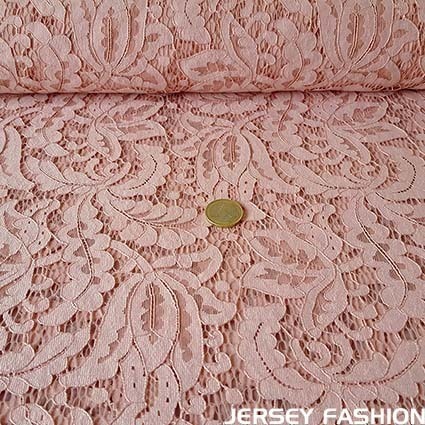 This washable lace fabric can be used as an accent fabric, but is also suitable as a dress, skirt or top. This fashionable fabric can optionally be lined with our cupro lining. 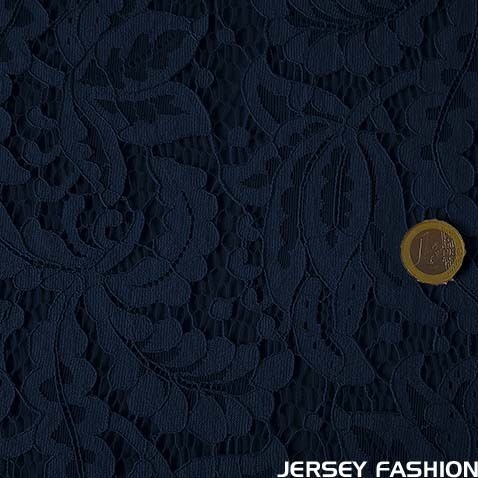 Hilco lace fabric "Biagio", dark blue, width 145cm, 53% polyamide, 47% cotton, 150gr/s.mtr. 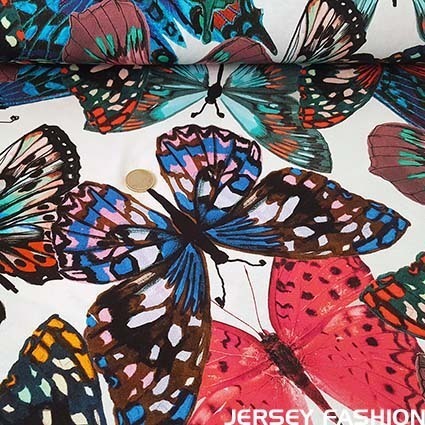 New Hilco viscose jersey fabric "Butterfly"
Hilco viscose jersey "Butterfly", width 145cm, 93% viscose, 7% elastane, 270gr/s.mtr. 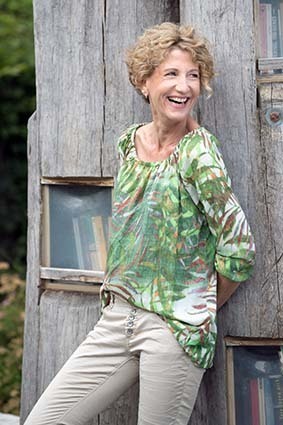 A cheerful and colorful butterfly design, digitally printed on a soft viscose jersey. This original design is printed on an ecru background. 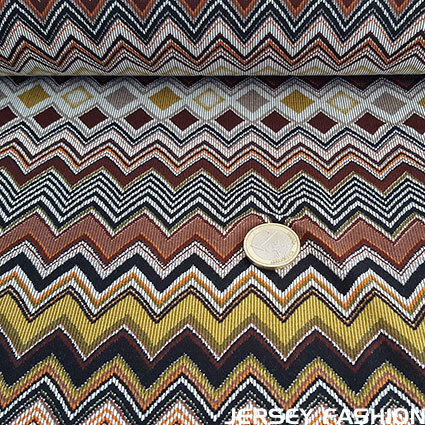 Use this jersey fabric for all your knit clothing and fashion projects. 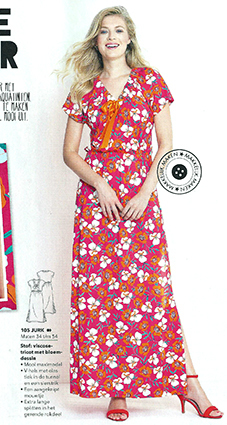 Ideal for sewing dresses, shirts, blouses, skirts and tunics. This jersey is produced in Germany. New Hilco woven rayon fabric "Senape"
Woven rayon fabric, Hilco "Senape", inkjet, width 140cm, 100% rayon, 110gr/s.mtr. 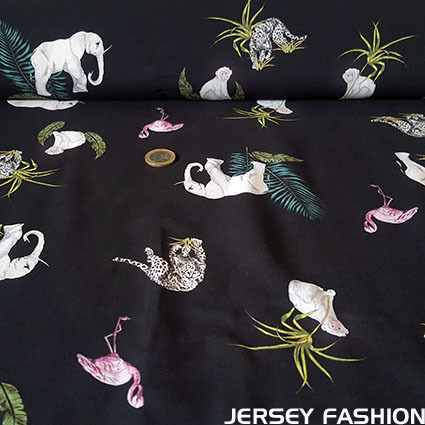 A stylish design of wildlife, digitally printed on a woven rayon quality. The design is printed on an black background. This fine woven rayon fabric, also called artificial silk, is wonderfully soft, supple, comfortable and breathable. A perfect quality for blouses, dresses, jumpsuits, tunics, tops and more. The Ökotex certified rayon weave is produced in Italy. 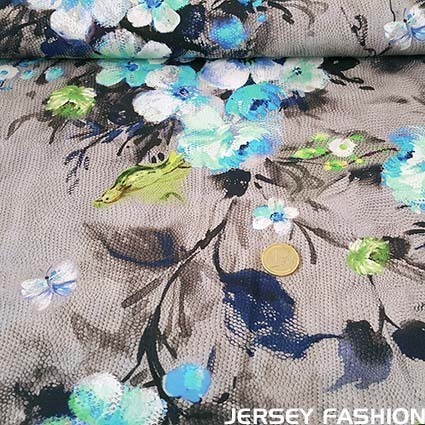 New Hilco viscose jersey fabric "Morisa"
Hilco viscose jersey "Morisa", width 155cm, 93% viscose, 7% elastane, 295gr/s.mtr. 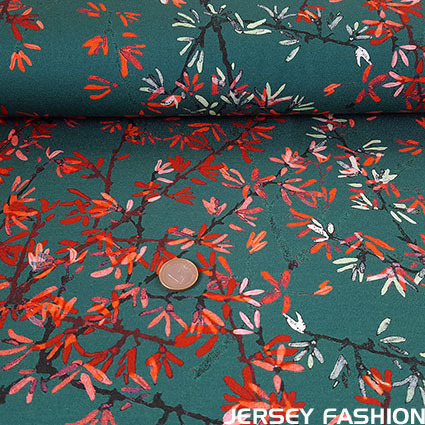 A charming pattern of blossom branches printed on a high quality viscose jersey! The original floral design is printed on a dark green background. This Ökotex certified quality fabric is produced in Germany. New Hilco viscose weave "Melissa"
Hilco viscose weave fabric "Melissa", width 140cm, 100% viscose, 115gr/s.mtr. An elegant design of flowers, butterflies and birds, digitally printed on a woven viscose quality. 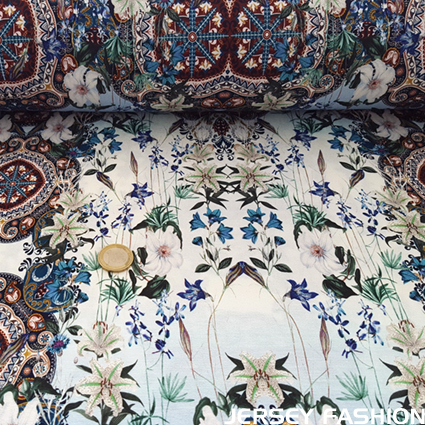 This high-quality viscose fabric is produced in Italy and can be used perfectly as a blouse, top, tunic, skirt or dress. New Hilco stretch cotton twill fabric "Foglia"
Stretch cotton twill fabric, Hilco, "Foglia", inkjet, width 155cm, 96% cotton, 4% lycra, 265gr/s.mtr. 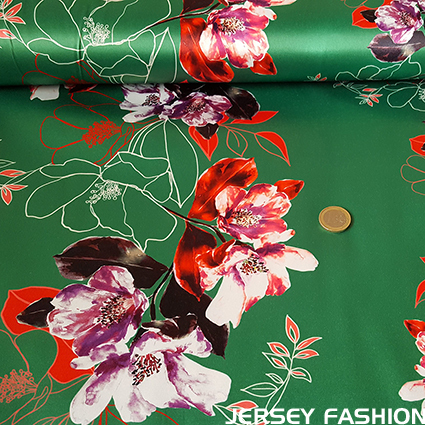 A wonderful floral design, in various shades of green, digitally printed on a stretch cotton twill fabric. This gorgeous stretch twill fabric is soft, supple, comfortable and of high quality. 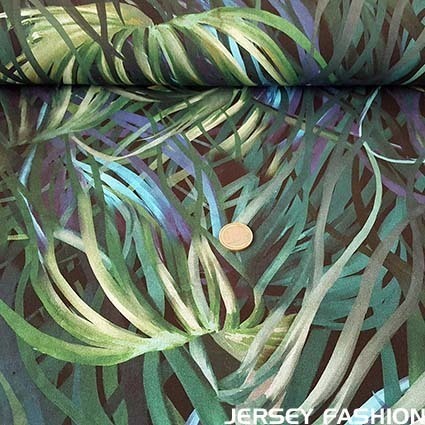 This stretch cotton fabric can be used for creating blazers, dresses, skirts or pants. New Hilco viscose weave "Luella"
Hilco viscose weave fabric "Luella", width 140cm, 100% viscose, 165gr/s.mtr. An original combination of a floral and stripe pattern, digitally printed on a woven viscose fabric. The design is printed on a black background. 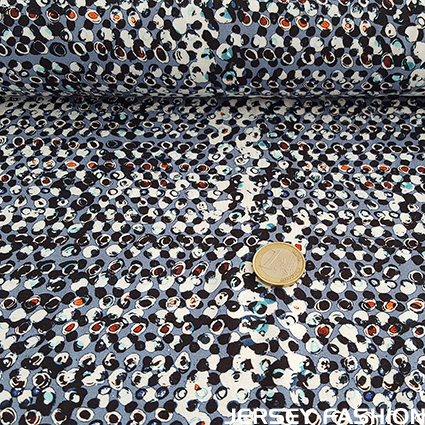 This high-quality viscose fabric can be used for example as a blouse, top, skirt, dress or summer pants. The Ökotex certified viscose fabric is produced in France. Hilco lace fabric "Biagio", off-white, width 145cm, 53% polyamide, 47% cotton, 150gr/s.mtr. New Hilco stretch satin fabric "Clarisa"
Hilco stretch satin fabric "Clarisa", width 145cm, 47% polyester, 50% cotton, 3% elastane, 260gr/s.mtr. An abstract floral design, digitally printed on a modern elastic satin fabric. The floral design is printed on a green fond. This smooth and shiny stretch satin quality combines the elegant and feminine look of satin with the comfort of cotton. The Ökotex certified stretch satin is perfect for a beautiful dress, pants, jumpsuit, skirt or blazers. New Hilco woven rayon fabric "Adulio"
Woven rayon fabric, Hilco "Adulio", satinized, inkjet, width 140cm, 100% rayon, 140gr/s.mtr. 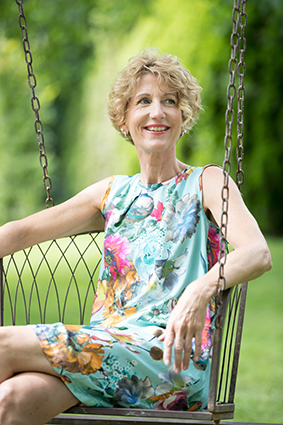 A magnificent floral design, digitally printed on a woven rayon quality with a silky feel. The floral design is printed on a mint green background. This beautiful satinized fabric is perfect for blouses, dresses, lingerie, tunics, tops and more. New Hilco viscose jersey fabric "Roldana"
Hilco viscose jersey "Roldana", width 145cm, 96% viscose, 4% elastane, 290gr/s.mtr. 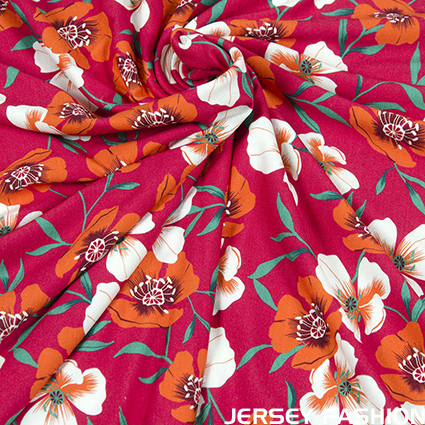 A cheerful flower pattern, in summerly colors, printed on a soft viscose jersey. This Ökotex certified quality fabric is produced in France. Hilco viscose weave fabric "Farina", width 135cm, 100% viscose, 115gr/s.mtr. 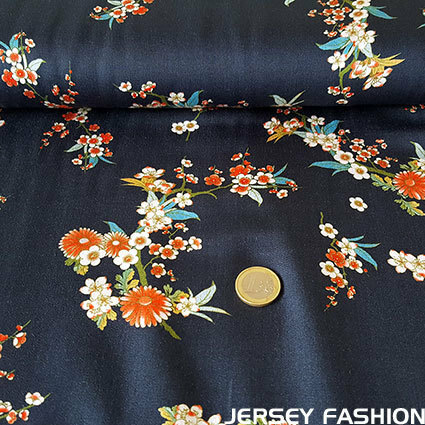 Soft and supple woven viscose fabric by Hilco with a floral design, on a dark blue background. Comfortable to wear. Perfect for creating blouses, tunics, tops, scarves, pants, jumpsuits, etc. Stretch cotton fabric Hilco "Camouflage Rose"
Stretch cotton fabric Hilco "Camouflage Rose", inkjet, width 140cm, 97% cotton, 3% lycra, 335gr/s.mtr. 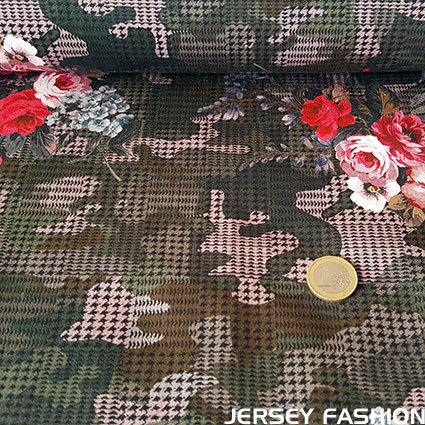 Beautiful stretch cotton fabric with a rose pattern digitally printed on a camouflage and pied-de-poule fond. This more sturdy stretch cotton fabric is supple, comfortable and of a super quality. 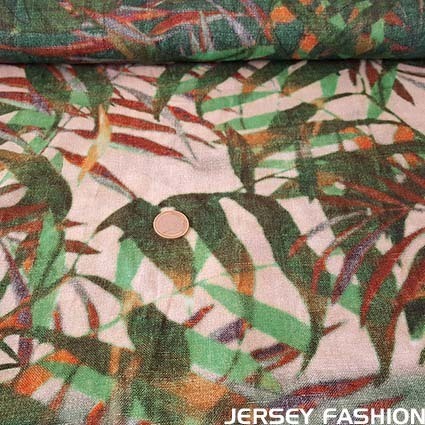 This stretch cotton fabric can be used for a blazer, jacket, dress, skirt or pants. Hilco viscose weave "Wild Flowers"
Hilco viscose weave fabric "Wild Flowers", width 135cm, 100% viscose, 170gr/s.mtr. 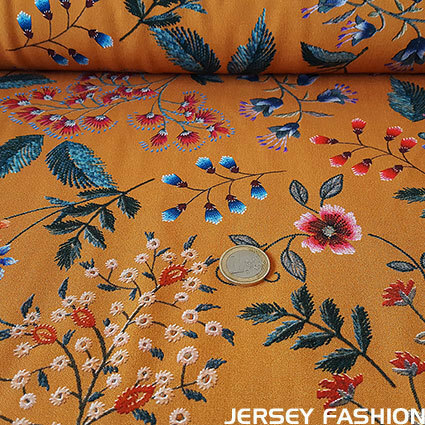 Soft and supple woven viscose fabric by Hilco with romantic floral design on an ocher-brown background. Comfortable to wear and perfect for creating blouses, tunics, tops, scarves, pants, jumpsuits, etc. 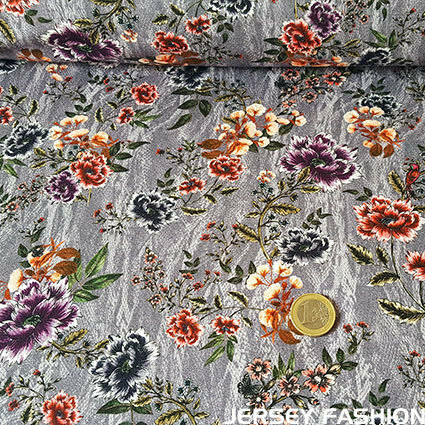 Hilco viscose weave fabric "Posy" lilac, width 135cm, 100% viscose, 110gr/s.mtr. 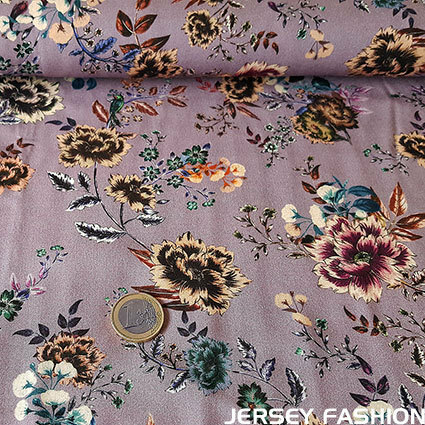 Soft and supple woven viscose fabric by Hilco with a floral design, in warm colour tones, on a lilac background. This viscose fabric is produced in France. Hilco viscose weave "Rose Dot"
Hilco viscose weave fabric "Rose Dot", width 135cm, 100% viscose, 105gr/s.mtr. 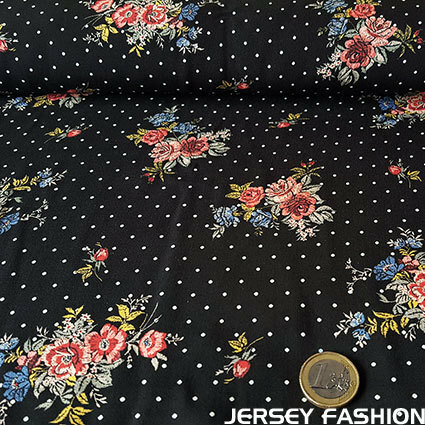 Soft and supple woven viscose fabric by Hilco with romantic design of roses and small white dots on a black background. Pleasant to wear. Perfect for creating blouses, tunics, tops, scarves, pants, jumpsuits, etc. Hilco inkjet viscose jersey "Gelo", width 150cm, 94% viscose, 6% elastane, 300gr/s.mtr. 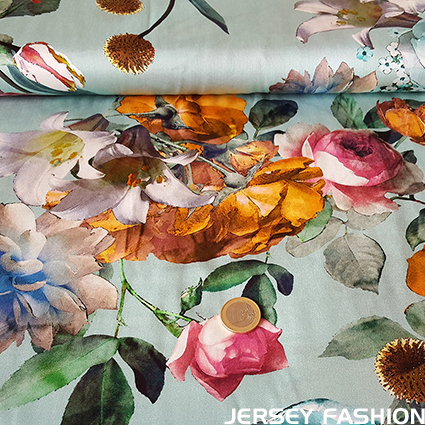 An astonishing floral design, digitally printed on a smooth viscose jersey! 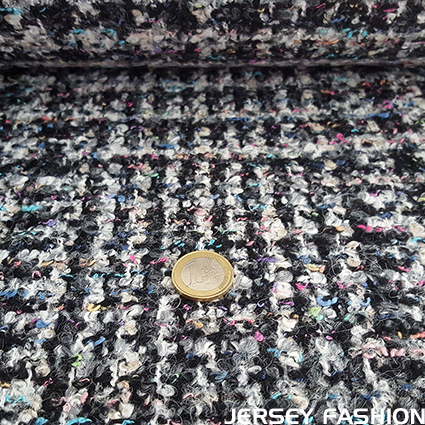 Use this high quality jersey fabric for all your knit clothing and fashion projects. Ideal for sewing dresses, shirts, blouses, skirts and tunics. This Ökotex certified quality fabric is produced in Italy. Hilco inkjet viscose jersey "Mystic Rose", width 145cm, 96% viscose, 4% elastane, 290gr/s.mtr. 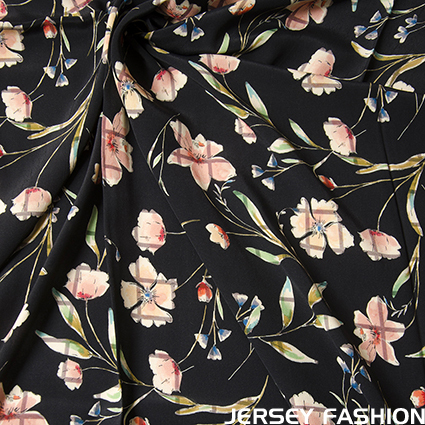 A romantic floral design digitally printed on a soft and flowing viscose jersey! This elegant design has been printed on a grey background. Hilco inkjet viscose jersey "Mica", width 150cm, 94% viscose, 6% elastane, 300gr/s.mtr. 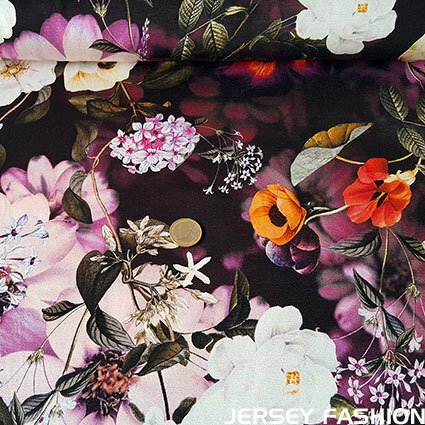 An astonishing floral design, in warm violet color tones, digitally printed on a smooth viscose jersey! Hilco inkjet viscose jersey "Fango-Zacs" brown, width 145cm, 95% viscose, 5% elastane, 260gr/s.mtr. 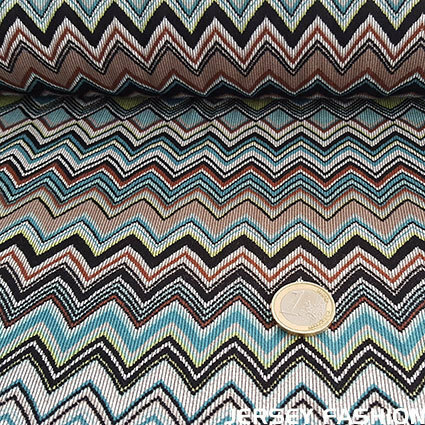 An abstract zig zag design, in beautifully combined color tones, digitally printed on a smooth viscose jersey! The quality fabric is produced in Italy and is ideal for use in dresses, tunics, skirts or shirts. Hilco bouclé fabric "Invierno", width 150cm, 21% wool, 44% polyacryl, 6% cotton, 27% polyester, 2% viscose, 580gr/s.mtr. This very chique and exquisite bouclé fabric shows a square design. Small square patterns in different sizes are woven into this smooth and luxurious bouclé fabric. Due to the bright coloured yarns that have been woven into this wonderful fabric, it's easy to combine. This feminin fabric could be used for skirts, blazers or jackets. Hilco jacquard weave "Shinny Nero"
Hilco jacquard weave "Shinny Nero", width 150cm, 48% cotton, 25% viscose, 25% polyester, 1% polyamid, 1% O.F., 510gr/s.mtr. An elegant jacquard woven fabric in an abstract timeless black and white pattern with a subtile woven silver yarn. This classic jacquard fabric can f.e. be used to sew pants, a blazer or skirt. Hilco inkjet viscose jersey "Fango-Zacs" turquoise, width 145cm, 95% viscose, 5% elastane, 260gr/s.mtr. Hilco inkjet viscose jersey fabric "La Stanga"
Hilco inkjet viscose jersey "La Stanga", width 145cm, 93% viscose, 7% elastane, 320gr/s.mtr. This modern abstract dots design is digitally printed on a grey background. This high quality European jersey fabric is printed through a modern inkjet print method. The jersey is knitted with a high quality viscose yarn which provides a long lasting jersey fabric. 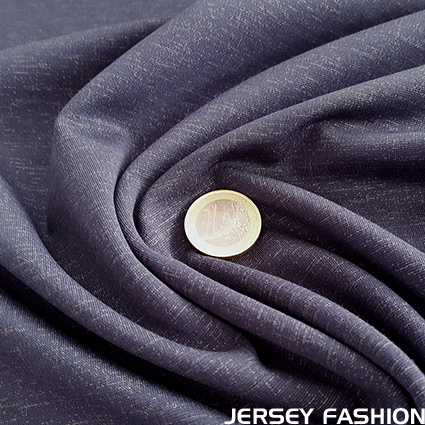 Hilco viscose jersey "Maniago", blue, width 140cm, 94% viscose, 6% elastane, 300gr/s.mtr. 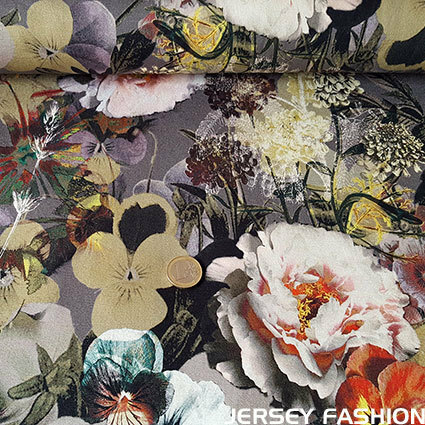 This wonderful graphic and floral design, in subtle colour tone combinations, is digitally printed on a smooth quality viscose jersey. The Ökotex certified jersey is knitted with a high quality viscose yarn which provides a long lasting jersey fabric. Hilco "Celeste", heavy jersey, two-way stretch, width 145cm, 60% viscose, 34% polyamide, 6% spandex, 495gr/s.mtr. An elegant and subtle gold design is printed on a high quality bi-stretch heavy jersey. 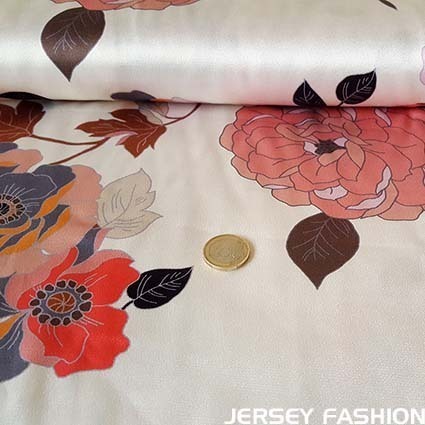 This heavyweight two-way stretch jersey fabric is ideal to sew "slim fit" or "regular fit" trousers, tunics, blazers, jackets, skirts or dresses. Hilco stretch jacquard fabric "Coruche"
Hilco stretch jacquard "Coruche", width 135cm, 52% cotton, 46% polyester, 2% elastane, 445gr/s.mtr. This soft flowing stretch jacquard fabric shows a beautiful floral pattern and a woven embossed fantasy pattern. The blossom pattern is digitally printed on an ecru fund. This elastic jacquard fabric ensures a perfect fit and offers great comfort. 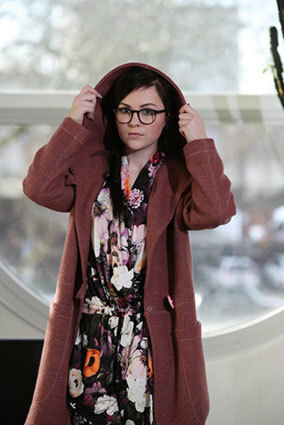 Ideal for a nice blazer, skirt or pants.